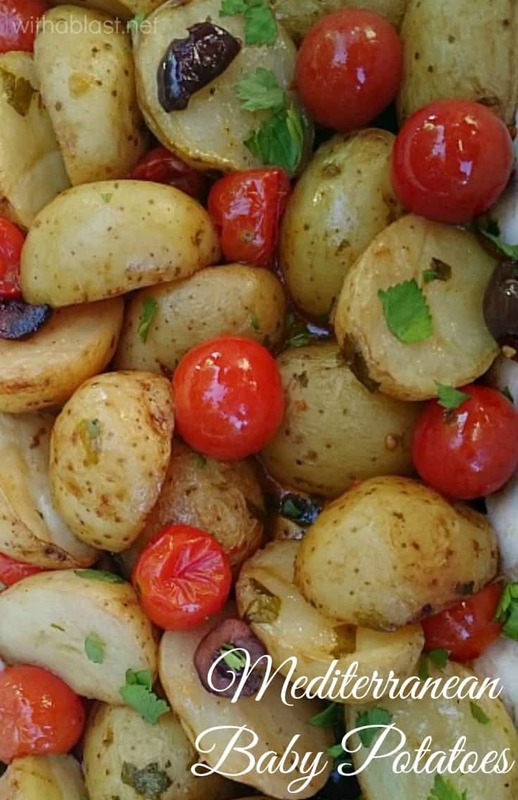 Mediterranean Baby Potatoes is bursting with the taste of the Mediterranean – bring this to your home with this scrumptious, easy Baby Potato dish ! We usually have potatoes more than once, and sometimes even more than twice a week, therefore I take it we are a potato fanatic family. These Mediterranean Baby Potatoes are one of our favorites and I love it because it is a no-fuss, bake and serve dish. Once again, I could not get hold of decent looking baby potatoes at our local supermarket. Which for more than one reason we would not be supporting any longer (after we’d been loyal customers for decades). 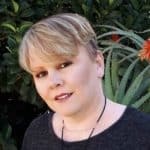 The store’s – and I mean the whole chain of stores – fruits and vegetables are really becoming second class and the shelves are not fully stocked. This makes finding something simple, like fresh herbs, almost impossible. The other reason we will stop supporting this chain of stores, is purely a political thing. I believe they should sell groceries and not even go near politics, which they unfortunately did. And are most certain to lose a load of previously loyal customers. But enough of that.. I could not resist taking a close up of this dish ! An extreme close up that is .. Look at those Tomatoes, just ready and on the verge of bursting. This is when a roasted dish with Tomatoes is most delicious ! With A Blast is all about easy, no-fuss recipes, but definitely not giving up on any flavors and deliciousness. 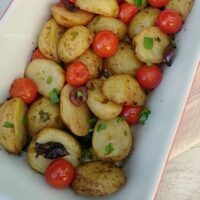 This Mediterranean Baby Potatoes dish is just that, no-fuss, quick to prepare/bake and very, very tasty. 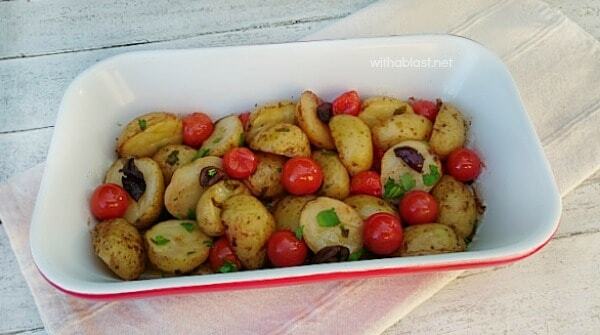 The perfect side dish for Thanksgiving, Christmas or as an everyday dish. 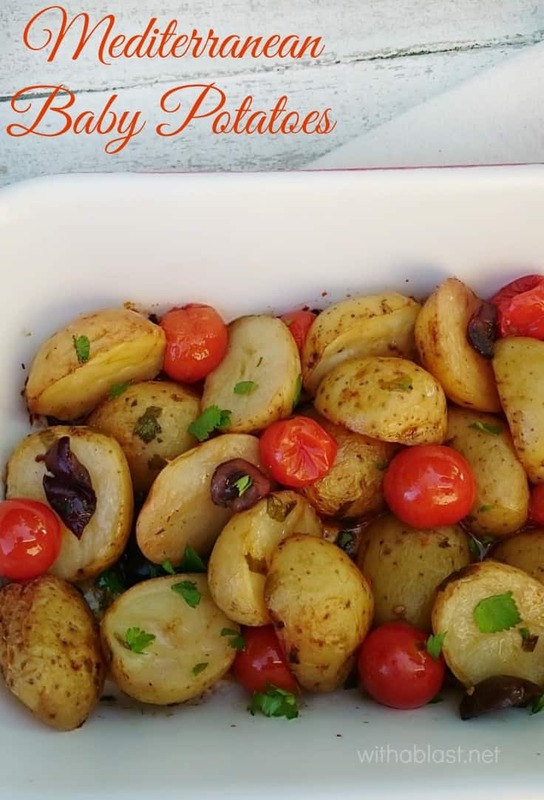 Mediterranean Baby Potatoes is bursting with the taste of the Mediterranean - bring this to your home with this scrumptious, easy Baby Potato dish ! This looks delicious! Love the olives! Bet it adds just the perfect amount of salt to the potatoes! My family would eat potatoes every day if I let them. These have a great flavor, thanks for the idea. All those wonderful Mediterranean flavors….Yum!! This dish looks full of flavor. Great recipe! I just pinned it and now I want to make them! They look so yummy!